Virginia Democratic Gov. Ralph Northam will go down not only as an executive who wore blackface for a dance competition but also what not to do during crisis management. 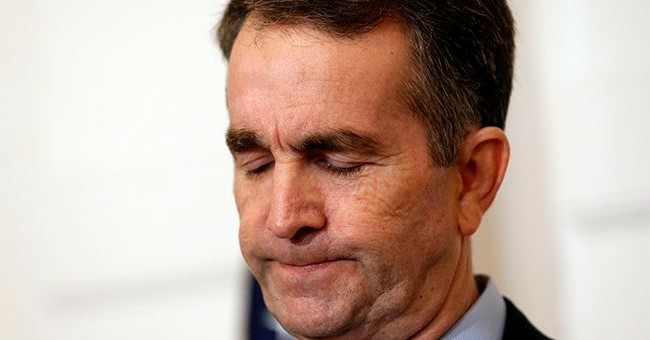 Northam is facing calls to resign after a racist photo was found on his 1984 yearbook page from Eastern Virginia Medical School last Friday. The picture showed two people, one in Klan regalia and the other wearing blackface. Northam apologized and admitted he was in the photo. He didn’t specify which character he was in the picture, however. Then, the next day, he retracted his apology, said it wasn’t him, and now has zero intentions of resigning. He also admitted to wearing blackface for a dance competition in San Antonio, where he dressed as Michael Jackson. Now, Northam’s latest explanation for why he can’t be in the photo just blew up in his face. He says he’s left-handed. The people in the photo are holding beers in their right-hand. Then, why is Northam doing stuff with his right hand? Myth busted? From the start, this was a total fiasco. With the photo, then the admission of guilt, the retraction, and now the refusal to resign. And now, with state Attorney General Mark Herring admitting he wore blackface in college to Lt. Gov. Justin Fairfax facing two sexual assault allegations. The entire Virginia Democratic Party has collapsed in less than a week. Fairfax is facing articles of impeachment if he doesn’t resign on Monday. Democratic House Delegate Patrick Hope of Arlington plans to put forward the motion. So, the two white guys who admitted to doing blackface stay, but the black guy is kicked to the curb? Yeah, that looks good. All three should go, but they won’t. That would give the governorship back to the Republicans.